When Ava wakes up, she has no idea who she is. The bedroom she's in, the house she lives in, and the mother who lives with her are all completely unfamiliar. The doctors tell her it's all the result of some medical anomaly, perhaps an infection, that has completely wiped her memory, and one day she may recover it. So Ava goes on living, struggling to remember everything that is unfamiliar about her life. Soon, she does start remembering things—but they can't be memories from the life she's living now. Then she meets Morgan—he's the first one to acknowledge that the life she's living now is a lie, and he's the key to figuring out who she is and reclaiming her life. 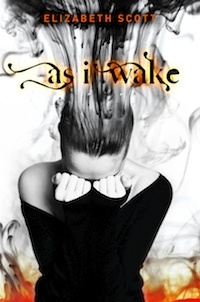 As I Wake is a very intriguing book with an unexpected twist. Fans of Scott's Love You Hate You Miss You will be attracted to it thanks to the brief summary, but this sci-fi mystery masquerading as a dramatic contemporary novel is more similar to Grace than any of her other work. Ava's situation is unique, and her questions are immediate: who is she? Where is she? Who doesn't she remember anything? And, how did she get to this unfamiliar place? Those questions are enough to hook readers, and the strange and uneasy atmosphere of Ava's home life and social life contribute to the overall feeling that something isn't quite right. Scott sprinkles in snatches of Ava's life before she lost her memory, giving readers a glimpse into an unsettling world where Ava walks a fine line between obedience and rebelling against what she has always known. The particulars of both the present world and Ava's past world are very vague and hazy, and readers never really learn how they are linked, or how exactly Ava got into the situation that she is in. Nonetheless, the tension between characters and the mystery of what happened to Ava is interesting, and that will keep readers going until the very end, even though many questions are left unanswered. Cover Comments: This cover is definitely different! The way the girl is hiding her face is neat, and the smoke from her hair kind of alludes to some events in the book. Very nice. Elizabeth Scott books are always on my TBR list. I like the way she develops the plots. This one sounds good. This sounds very interesting. The plot sounds similar to a book I just read called "Before I Sleep" by S.J. Watson. But I'm sure it's actually very different, sounds like it has a twist! Gah, that cover is gorgeous! I have a weakness for amnesia stories, so I'm definitely intrigued. And I love a good scifi that doesn't rely on aliens and planetary takeovers for plot. I absolutely love Elizabeth Scott's books, and I NEED to get my hands on this one. Great review! The summary of this book doesn't give much to go off of what the book is about-- quite mysterious actually. The cover is intriguing though. I'm interested to see what happens in this novel! I just read this book as an independent for my English class.....I hate it. We had to do an author study so I chose Elizabeth Scott since I like her novels. This was the last book I read for my last report....again, I hate it. Now, I am a good reader, easily flying through novels and I enjoy a good book like the Great Gatsby or Of Mice and Men or Harry Potter, Divergent and so on. BUT I CANNOT COMPREHEND THE ENDING OF THIS NOVEL. I am hopelessly lost and writing a book summary due in a few days. I shouldn't have to Google the ending of a novel, but I do. I did not care for the main character, and the plot/Ava's alternate world is never fully explained. Only eluded to. Readers beware: this'll throw you for a twist, and not in a good way. I agree with you. The book was very hard to comprehend. Unfortunately, it was very poorly written, all over the place and never came together. I think in the end, she ended up dying and going to another universe where her and Morgan were able to be together.